What should have perhaps been our "finest hour", the culmination of weeks of intensive research, has taken on a sour note. We find that The Sunday Telegraph, having ostensibly seconded their reporter Robert Mendick to "help" us in our investigation, has instead ripped-off our work, claiming it as its own. Thus, the egregious Mendick takes the credit for work he has not done, being given the lead slot in a full-page feature on Pachauri, with a very much truncated version of our own story down page. This is classic MSM behaviour, which we have come to know and love. That said, the two stories together present a powerful indictment of the chairman of the IPCC, and puts Pachauri "in the frame" with some uncomfortable questions to answer. In a letter to the newspaper, Pachauri denies any wrongdoing – as you would expect – claiming that no part of the payments to his institute, TERI, is received by him, "either directly or indirectly." In the same letter, however, Pachuari claims to be a "full-time, salaried employee" of TERI, yet does not seem to be able to make the connection between monies paid into his institute and the salary paid out to him, as if they were totally unrelated. 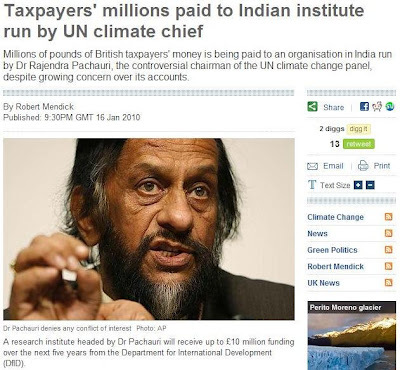 And, having issued some figures for the turnover of the Institute – on an otherwise unmarked spreadsheet, which wholly lack credibility – Pachauri continues to be evasive about the amount of money he is paid, despite living the lifestyle of a multi-millionaire. This, therefore, is by no means the end of the matter, not least because Pachauri seems to be trying to pull of the same trick with TERI India accounts as he has with TERI Europe, under-declaring the income in the hope of evading scrutiny – and much else besides. Thus, although the man claims his actions are "not for reasons of tax evasion or money laundering," he is going to have to do better than he has so far to convince us that his dealings are above board. They are certainly not "open". A man who delights in lecturing on corporate "transparency" could benefit from listening to his own words.